D ating from Bashar al-Asad’s first suppression of mass demonstrations in April 2011, the war in Syria is now 3 years old, has killed more than 130,000 Syrians, and displaced nine million Syrians, two million as refugees into neighboring countries. Foreign intervention has increasingly shaped the course of the fighting and will continue to have substantial regional consequences. The complexity of this bitter, nominally internal struggle has dampened American enthusiasm for joining the fray or even paying much attention to Syria, notwithstanding the chemical weapon attacks on Gouta, east of Damascus, last August, which captured the attention of the American people, media, and policy community. 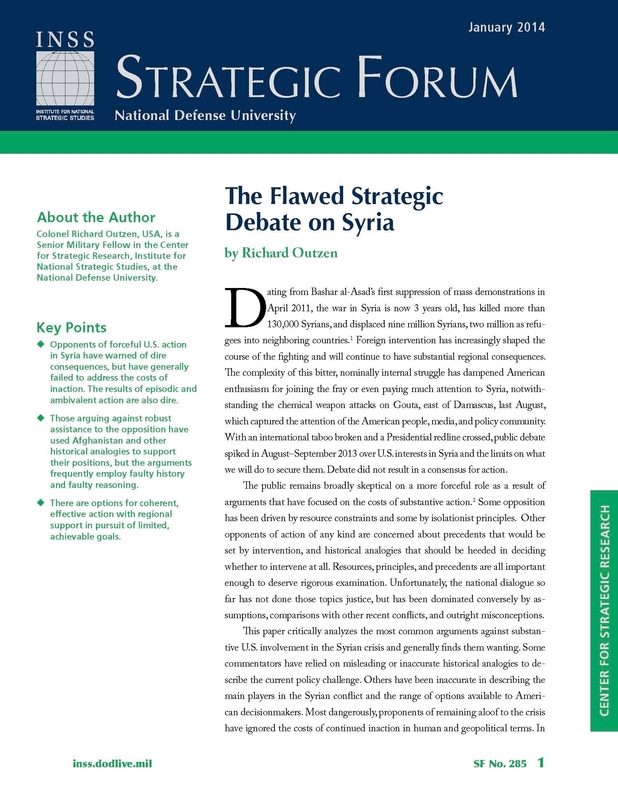 With an international taboo broken and a Presidential redline crossed, public debate spiked in August–September 2013 over U.S. interests in Syria and the limits on what we will do to secure them. Debate did not result in a consensus for action.